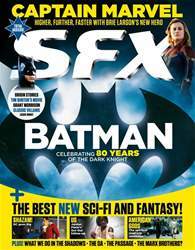 SFX is the must-have magazine for any fan of sci-fi, fantasy or horror - covering these exciting genres in all forms, including TV, film, comics, books, graphic novels, video games and collectables. In each issue, you’ll discover everything you need to know about all of the latest mainstream sci-fi shows and blockbusters, as well as the small screen niche productions we all love to discover. SFX is produced by people with the uppermost passion and knowledge of all things sci-fi, producing a wonderful magazine with stunning graphics and a large array of first-class features, exclusive interviews, behind-the-scenes stories and in-depth reviews. Get your monthly digital subscription today and join the SFX community. Enjoy exclusive interviews with the biggest stars in sci-fi, as well as news, reviews and features on all things sci-fi, fantasy and horror. After eight seasons, thousands of extras and many, many gory deaths, TV’s biggest fantasy epic is calling it a day. Drinks all round, then – they’ve earned it. Will it simply be three hours of Thanos putting his feet up on the farm? Or Iron Man chatting with sentient piles of dust? We explain why the MCU has grander plans. The former 007 and Flash Gordonstar talks DC’s Doom Patrol. First launched in 1995, SFX magazine has gone on to become one of the leading voices covering the genres of sci-fi, fantasy and horror. It provides in-depth authoritative coverage on all things sci-fi, fantasy and horror, providing in-depth articles, TV guides and exclusive interviews with the actors, directors, designers and writers. Whatsmore, SFX magazine keeps you up-to-date with all the latest releases, written by the experts in unique fun, wit and authority with a touch of panache. Be the first to discover everything you need to know about all areas of your favourite genres, from books and films to comics and collectables - from big-budget productions to tiny hidden gems! As well as bringing you extensive coverage of the best in sci-fi, SFX magazine also offers exclusive reviews of the worst releases, to ensure you don’t waste your time and money on entertainment which will likely leave you disappointed. SFX magazine is proud of its position at the head of the sci-fi community, bringing its readers together to celebrate and enjoy all things good and bad in sci-fi, fantasy and horror. It’s quite simply the must-read publication for any fan of these popular genres. Access to the actors, writers, directors and designers of your favourite sci-fi, fantasy and horror productions. News on the very latest releases - both good and bad!